Last Friday I talked about how we have been in a muted Economic Winter Season. We may have had the greatest stock market bubble ever, but our economic “recovery” has been the weakest on record, despite the strongest, globally-concerted stimulus ever. Notice how the cumulative GDP growth since 2007 is 19%? It was 20% from 1929 through 1940. That means this period has actually been slightly worse. The clear difference is that the Great Depression started with the greatest crash in U.S. history, with stocks down 89%, 25% unemployment, and a GDP fall of 30% between 1929 and 1933. The current Economic Winter Season also started with a stock crash and high unemployment: 54% loss in the markets, near 11% unemployment, and a GDP fall of 4.3%. 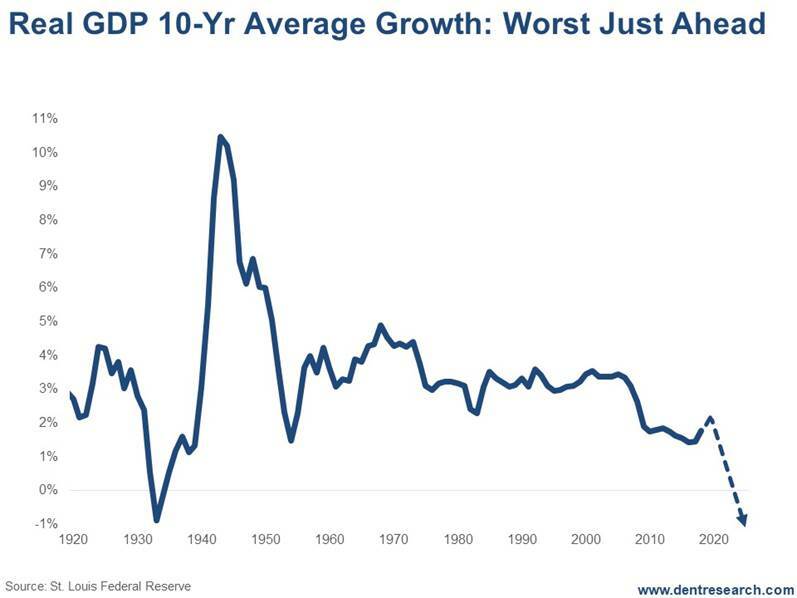 But the recovery from 1933 to 1937 saw average real GDP growth of a whopping 9% per year. We’ve managed to eke out just 2% per year. Then there was a less severe crash and mini-depression or great recession in 1938 that lingered into 1942. Stocks bottomed in 1942 and the next great long-term bull market began. Look at that remarkable difference: The period after 2007, with an average of 2% GDP, has already been lower than the extended recession and inflation trends of the Economic Summer Season from 1968 to 1982. A final deep depression, debt deleveraging and economic crisis will see a 20%-plus fall in GDP, 15%-plus unemployment, and a stock crash that could rival that -89% for the Nasdaq and maybe even the Dow.